Oklahoma City’s Museum of Art hosts rooftop gatherings that reflect the new spirit of OKC. 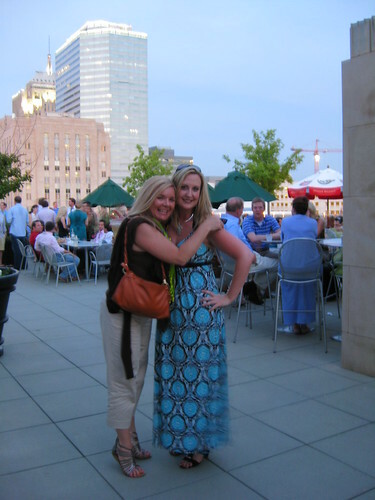 Carrie Corbin and Lori Wagner Ford, photo by Becky McCray. Tourism is economic development, and it influences all your recruiting efforts. Cynthia Reid said this while talking about recruiting businesses. Every effort you make to improve the visit-ability of your town also enhances your economic development. It influences your ability to recruit new businesses, attract entrepreneurs, or promote the return of alumni. Cynthia Reid is the VP for Marketing and Communications for the Oklahoma City Chamber of Commerce. She talked about their city’s image among site selectors, senior managers, and key employees who might be transferred in this kind of expansion. Because the OKC Chamber talks to site selectors with good news about the city all the time, the city’s reputation with them is very good. Because they seldom used to reach out to senior managers or key employees, the city’s reputation there is very poor. The result was site selectors would put Oklahoma City on the list of finalists in a site selection, and the senior managers would often just delete it out of hand. Lesson: reaching site selectors is good, but senior managers and employees matter also. Bottom line: Tourism is economic development, and tourism influences all your recruiting efforts.